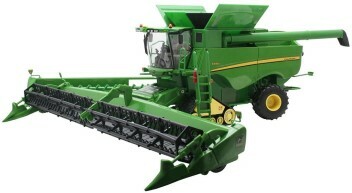 * Up front is its imposing header which comes with interchangeable 640FD draper head for grain and the 616C corn head. * Up top, the S690i features the largest grain tank capacity of any combine, plus a moveable feeder housing with an opening body panel with drop down ladder. * Down below, there are free-rolling rubber front tracks for extra traction and a pivoting rear steering axle. * Other details include a rotating grain augur that swings out to the side.